The rapid fire jokes, entertainment, and heartfelt stories that led to a fast-paced, yet very fun and informative hour. Nothing against the show, but sitting in the front row, I sometimes had an issue seeing images on the project because of the placement of the shower. That’s not a complaint with the show by any means, just the way the stage is. If you want to see the show, sit a few rows back. If you want to be immersed as much as possible, sit in the front and don’t worry about the projector. 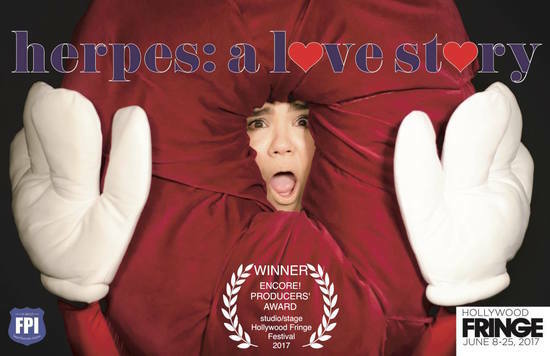 Hilarious, bold, and poignant, Herpes is a fascinating journey that provides a public glimpse into the private world of the performer that not only touches the entertainment on the surface, but digs down to provide the humanity and emotional baggage as well to tell a story that, while visual and fast-paced on the outside, is full of compassion, heartbreak, and raw truth on the inside.